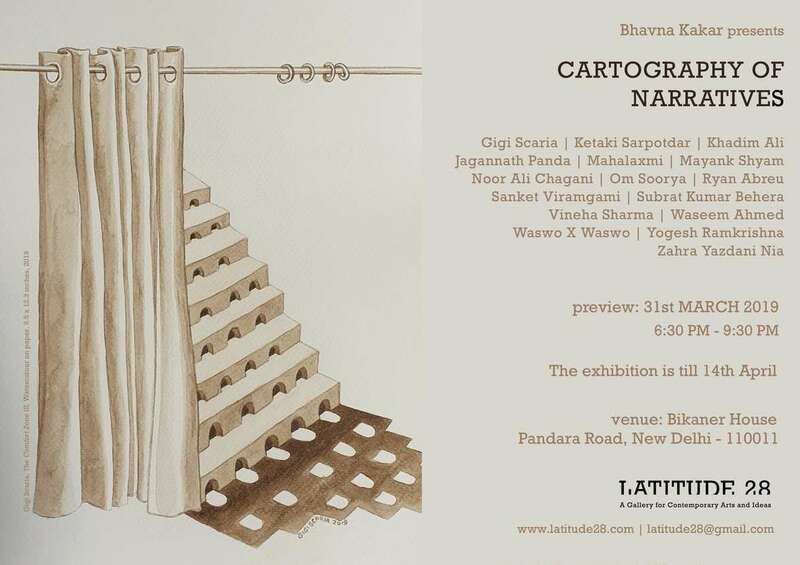 Latitude 28 gallery presents CARTOGRAPHY OF NARRATIVES which explores the various forms of narratives that exist today. The participating artist are Gigi Scaria, Ketaki Sarpotdar, Khadim Ali, Jagannath Panda, Mahalaxmi, Mayank Shyam, Noor Ali Chagani, Om Soorya, Ryan Abreu, Sanket Viramgami, Subrat Kumar Behera, Vineha Sharma, Waseem Ahmed, Waswo X Waswo, Yogesh Ramkrishna and Zahra Yazdani Nia. To illustrate this diversity of narrative methods, the artists draw upon fables, conversations, memories, histories, metaphors, allegories and dreamscapes, among other forms, to confront the notions of appropriation of present-day realities and future possibilities, through still or moving images. The contrasting experiences between the civilization’s demand for conformity vis-à-vis the influence of a visual language that allows for multiple possibilities was perhaps the starting point for the development of this exhibition. One can therefore encounter hybrid motifs that invariably fuse reality and fantasy to create a collection of signifiers. Interspersed with the physical, the architectural and the natural, the ‘Cartography of Narratives’ becomes a mapping of the lived, imagined and the oneiric, that clutch within its framework, hints to aspects of reality. The panorama is structured on a network of consequences, with possible contingencies determined by their causal relationships. Fact and fiction become ambiguous entities.